Deir an Rialtas go bhfuil aisghabháil ag teacht. Má tá, ní aisghabháil chothrom í. Is aisghabháil dhé-shrathach, mhí chothrom í a rachaidh chun tairbhe dóibh féin agus dá gcairde ag an bharr agus chan do mhóramh Éireannaigh córa atá ag obair go dian dícheallach. 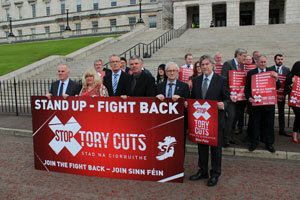 Creideann Sinn Féin gur féidir aisghabháil chothrom a ghnóthú. 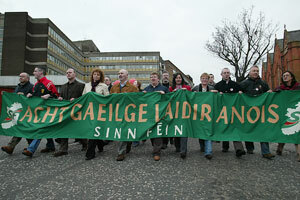 Creidimid gur féidir sochaí cóir a bhaint amach. Creidimid gur féidir cothroime agus dóchas a chur in áit cairdeas fabhair agus saint. Tá cuid mhór samplaí de ghéilliúlacht an Rialtais don scothaicme Baincéireachta agus institiúidí airgeadais eile agus do na ciorcail órga a ghnóthaigh as an chúlú. Tá níos mó arís samplaí de ionsaí an Rialtais in éadan cearta agus teidlíochtaí saoránach agus den chruatan millteanach atá leagtha acu ar dhaoine ar íseal agus ar mheán-phá, ar pháistí agus ar sheanóirí. 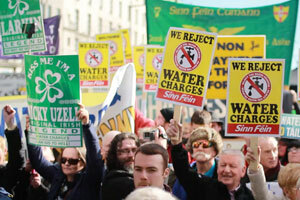 Scrios Fianna Fáil an eacnamaíocht agus is beag atá foghlamtha acu ó shin. Tá Fine Gael agus Lucht Oibre anois ag déanamh aithrise ar a gcuid polasaithe. I mbuiséad 2015 nuair a bhí deis acu ualach mhuintir na hÉireann a laghdú, roghnaigh siad cuidiú leis an 10% a ba shaibhre. Tá siad anois ar tí muid a fhilleadh ar ais chuig cuid polasaithe ‘borradh agus cliseadh’ Fhianna Fáil, áit ar cuireadh na billiún €uro amú ag ceannach toghcháin agus táimid go léir ag íoc go daor as riamh ó shin. Tá athrú mór de dhíth orainn maidir leis an dóigh a ndéantar polaitíocht. Táimid ag iarraidh tús a chur le díospóireacht faoin todhchaí, faoin cineál tíre agus sochaí a bhfuil muid ag iarraidh cónaí ann, faoi chomhionannas agus faoin cineál aisghabhála atá de dhíth orainn. Is féidir leatsa a bheith páirteach san athrú seo i bpolaitíocht na hÉireann. Tá cinneadh mór os comhar mhuintir na hÉireann agus tá plé ionraice de dhíth orainn. Beimid ag tabhairt an díospóireacht seo chuig gach pobal ar fud na tíre sa bhliain seo atá amach romhainn agus muid ag druidim le comóradh céad Éirí Amach 1916 agus ag comhlíonadh idéalacha an Fhorógra. 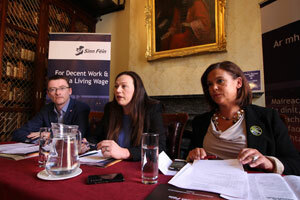 Leagtha amach thíos tá forbhreathnú ar ár bpolasaithe chomh maith lenár gCartlann Doiciméad Polasaí. Cartlann Doiciméad Polasaí - Breathnaigh, roinn nó íoslódáil ár ndoiciméid polasaí deireanacha sa rannóg cartlainne speisialta seo. Cúram Sláinte do Chách - Tá an córas sláinte ag cliseadh go leanúnach mar gur córas míchothrom, dé-srathach, poiblí-príobháideach atá ann. Níl fáil ar chúram atá bunaithe go sonrach ar riachtanas. Ceart chun Tithíocht - Tá foscadh fiúntach ar cheann de na riachtanais daonna is bunúsaí agus mar sin de ceann de na cearta daonna is tábhachtaí. 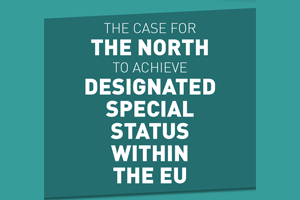 Brexit - Special status for the North within the EU - Sinn Féin believes that the only credible approach is for the north to be designated a special status within the EU and for the whole island of Ireland to remain within the EU together. An Ghaeilge - Léiríotar sa bheartas polasaí seo cuid de na céimeanna de dhíth chun na Gaeltachta agus na Gaeilge a chosaint ó thuilleadh creimidh agus tús a chur le hathbhunú uirthi mar theanga bheo bheoga do shaoránaigh na hÉireann. 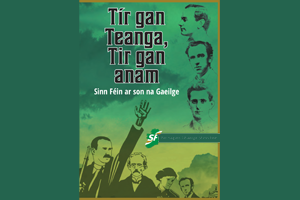 Cearta Cothroma do Ghaeilgeoirí - Tacaíonn Sinn Féin le aisghabháil na Gaeilge mar theanga labhartha i measc mhóramh mhuintir na hÉireann agus le cruthú sochaí atá go deimhin dátheangach. 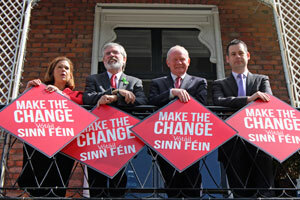 Margadh Nua don Iarthar - Sinn Féin has a vision for the West of Ireland. A vision to make it a sustainable place to live and work. 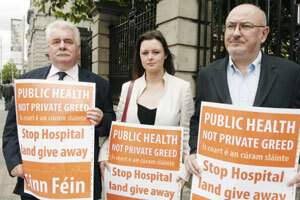 A place where the quality of life is matched by the quality of public services. Ag dul i nGleic leis an Ghéarchéim Cúram Leanaí - Tá cúram leanaí de dhíth orainn atá sábháilte, ard -chaighdeánach agus inacmhainne. Tá cúramóirí leanaí de dhíth orainn atá oilte go dtí an caighdeán is airde agus córas atá cláraithe agus a bhfuil monatóireacht rialta déanta air. 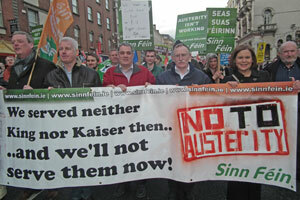 Tá cúram leanaí inacmhainne de dhíth orainn. 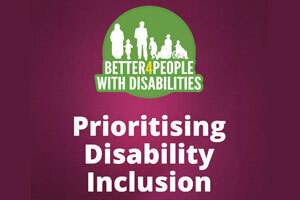 Prioritising Disability Inclusion - An audio version of our Prioritising Disability Inclusion document here. 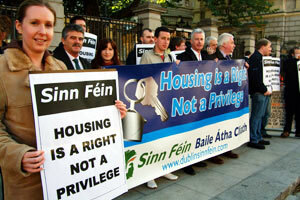 Sinn Féin has a vision for society in which all citizens can participate fully in life without being left behind. 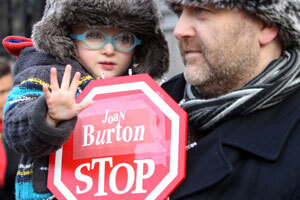 We will further the rights of people with disabilities, not diminish them. Poblacht do chách - Tá an fís poblachtach Éire aontaithe bunaithe ar na prionsabail comhionannas, cuimsiú agus ceannas. 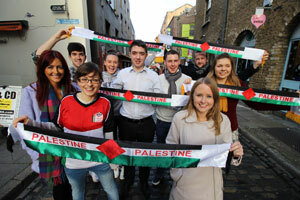 Ní féidir áit ar bith a thabhairt do sheicteachas, leithcheal nó do idirdhealú. 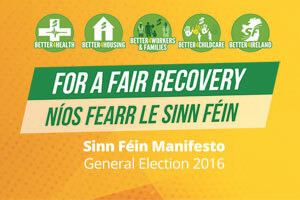 General Election 2016 Manifesto - Sinn Féin General Election 2016 Manifesto. Córas Cánach Cóir - Éilíonn aisghabháil chothrom córas cánach a ghnóthaíonn go leor ioncaim do rialtas ach i ndóigh atá cóir agus forásach. 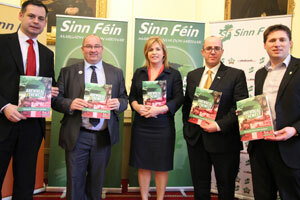 Diúltú do Chiorruithe na dTóraithe - I dtuaisceart na hÉireann chuir Sinn Féin bac ar an Bhille Leasa agus ar na ciorruithe atá na Tóraithe ag iarraidh a bhrú ar na daoine is leochailí. Obair Fhiúntach agus Pá Fhiúntach - Caithfear tosaíocht a thabhairt do chruthú poist fhiúntacha le pá fhiúntach agus fíor thiomantas d’ár n-earnáil Fiontair Bheaga agus Mheánmhéide. 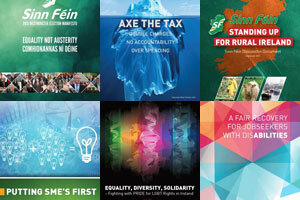 Ag dul i nGleic le Fiacha - Creideann Sinn Féin go daingean gur féidir socrú níos fearr a fháil ar na fiacha poiblí agus príobháideacha.